It has come to our attention today that there are lots of mummy bloggers who are looking for sponsorship so that they can attend the CyberMummy 2010 conference. Tickets are £80 (at the early bird rate) and some bloggers are looking for a contribution towards travel too. 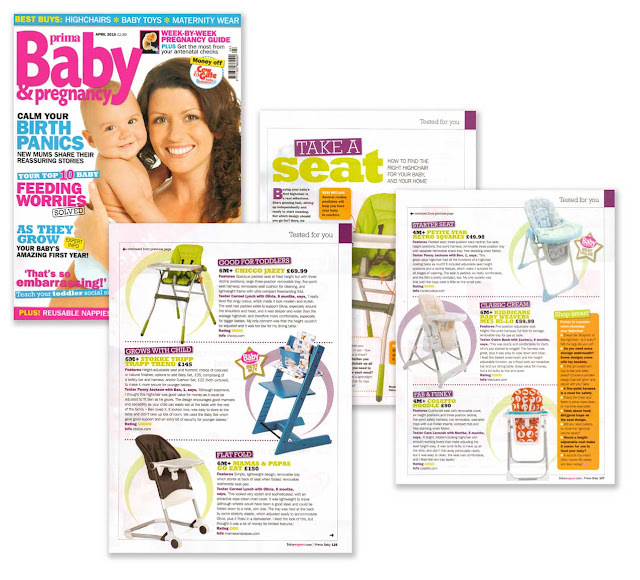 Thank you to Prima Baby magazine for once again including Tripp Trapp® in their highchair test. once again it comes away with an award - this time Best Buy. We couldn't agree more. It's here! CyberMummy - a conference devoted solely to mummy bloggers and the kinds of thing we want to talk about! After all the great meet-ups, we wanted more: more networking and more advice and perhaps a bit more wine (or at least biscuits). So three of us BMB'ers - Susannah, the founder amodernmother.com , Sian (yes that's me) mummy-tips.com and Jennifer alphamummy.com - have banded together and organised a one-day event where we can share stories, trade tips and learn a few things from experts and each other. The day will have sessions devoted to content, understanding technical things like SEO and making money with your blog. It's a day that's for and about bloggers: you'll see some of your favourite bloggers on panels, steal their best ideas in CyberLabs and debate issues over coffee or lunch. PLUS we want you to be a part of it. At the end of the day instead of the typical conference wrap-up, we're hosting a Crowdsourced Keynote: a collection of best posts from attendee's blogs, read by them. So register for the conference now then nominate one of your favourite posts (maybe your most popular, maybe just the one that meant the most to you) or a post from someone else's. Sign up now and you can even take advantage of our great discount: the early bird rate is only £80, a £20 discount. Take advantage of it now - it only lasts until April 15. The conference takes place on Saturday 3 July at the Earls Court Ibis in London. Go to CyberMummy.com to find out more and to register now!